It's a tale of two dinners at the Drummond Ranch — one for the kids and one for the grownups. The kids are tucking into Baked Ziti, while Ree makes Rib-Eye Steaks With Cowboy Butter, Baked Potatoes with all the fixin's and Cheddar Bacon Wedge Salad for the adults. It's all followed by gooey and decadent Molten Chocolate Cakes and of course, some ranch pranks! 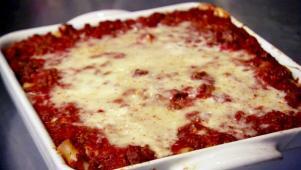 Cheesy Baked Ziti is Ree's kid-approved go-to quick supper for a crowd. 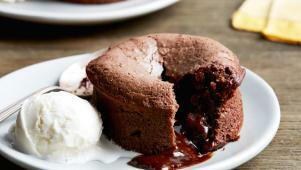 Ree's decadent Chocolate Lava Cakes are an easy make-ahead dessert.